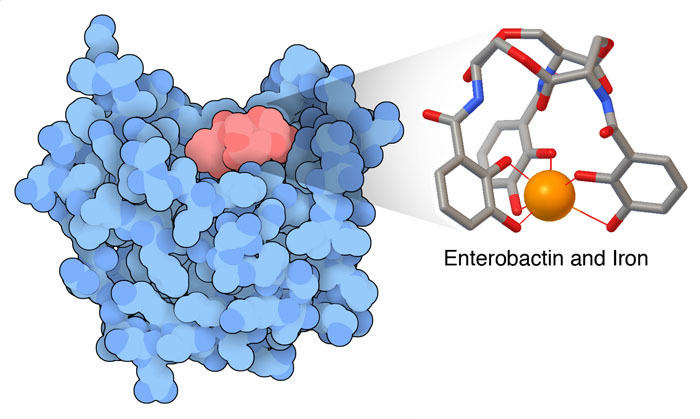 On the left, siderocalin is in blue, bound to the siderophore enterobactin in red. The bound iron ion is shown with an orange sphere at right. Since its beginning, humankind has been under constant attack by bacteria. To counter this attack, our distant ancestors evolved a manifold collection of molecules for protection. Many of these are hard-wired to fight the most common foes, and make up our "innate" immune system. Many attack weak points of the bacterial cell wall, for instance, lysozyme breaks down the protective coat of peptidoglycan and dermcidin pierces their cell membranes. Siderocalin attacks an entirely different weak point of bacteria: their need for iron. Iron is abundant in the environment, but locked up in forms that are difficult for cells to use. Soluble iron ions, on the other hand, are rather rare. We get most of ours from the food that we eat, conveniently prepackaged in meat and vegetable proteins. Free-living organisms like bacteria, however, need to scavenge for iron and grab it when they find it. Many bacteria build molecules that wrap tightly around iron ions, called siderophores. They secrete these siderophores into the surrounding environment, where they search for trace iron ions. Then, the bacterium gathers up the siderophores and pries out their precious cargo of iron. Our innate immune system blocks this process sequestering the siderophores before the bacteria get a chance to find them. We build a protein called siderocalin that has a pocket (fancifully called the "calyx" by structural researchers) that binds extremely tightly to siderophores. The structure shown here (PDB entry 3cmp ) includes a common siderophore called enterobactin trapped in siderocalin. Of course, bacterial populations are constantly evolving, and some have discovered ways to circumvent our protection by siderocalin. They do this by creating new "stealth" siderophores that still have the ability to gather iron, but which do not bind to siderocalin (see, for instance, an article on stealth siderophores made by anthrax bacteria). Remarkably, the bacterium that causes Lyme disease has taken an even more drastic approach, and has evolved a proteome that completely removes any need for iron. Lactoferrin, with iron (yellow) and carbonate ions (red and white), and tear lipocalin, with a small organic compound (red) in the binding site. The battle for iron is so important that we have also evolved other proteins that participate. Two are shown here. Lactoferrin (PDB entry 1lfg ), takes a different approach, ensuring that the level of free iron ions is so low that bacteria can't find them. It binds to two iron ions, along with carbonate ions, similarly to transferrin, which transports iron in our blood. Lactoferrin, as the name implies, is found in milk and other secreted body fluids, and is also released by white blood cells to soak up all the iron around an infection. 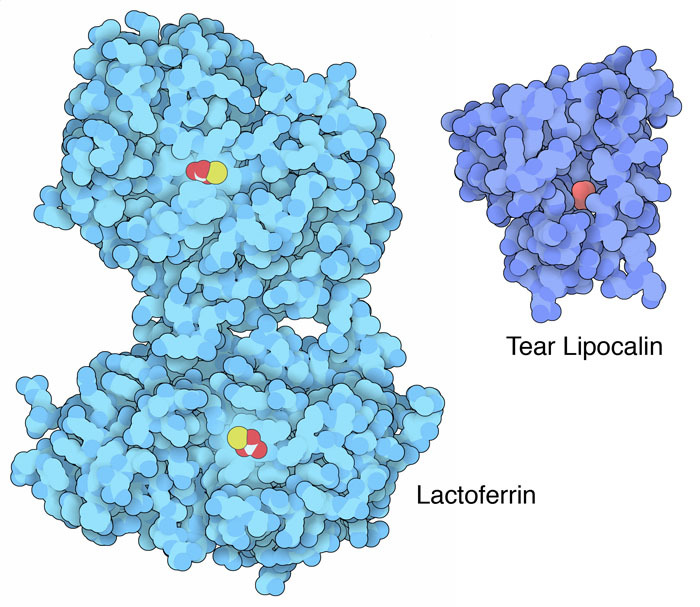 Tear lipocalin (PDB entry 3eyc ) is the second most plentiful protein in tears (second only to lysozyme), where it plays a number of defensive roles, including binding to molecules such as siderophores. Structural biologists have discovered several interesting wrinkles on the siderocalin story. Recently, in PDB entry 4zhd , it was discovered that it binds to plutonium and may play a role in the trafficking of toxic radioactive ions in the body. Scientists have also been looking for endogenous siderophores, which would be made naturally by our bodies and help traffic iron ions inside cells. PDB entry 3fw4 includes one candidate, catechol, bound to an iron ion. To explore these structures in more detail, click on the image for an interactive JSmol. Siderocalin is a member of a large group of lipocalins, which have a cup-shaped binding site for molecules. You can explore other members by searching for "lipocalin". Iron is used for many functions in cells, for instance, to transport oxygen in hemoglobin and as electron carriers in proteins of the electron transport chain. Try doing an advanced search with the chemical formula "FE" to get a listing of the PDB entries that include iron. C. Correnti & R. K. Strong (2012) Mammalian siderophores, siderophore-binding lipocalins, and the labile iron pool. Journal of Biological Chemistry 287, 13524- 13531.